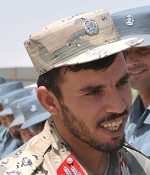 Khaama Press: The provincial police chief of southern Kandahar General Abdul Raziq has said he will not return to Kandahar until Tarinkot city is fully cleared of Taliban insurgents. Tarinkot city is the provincial capital of southern Uruzgan province which witnessed heavy clashes last week as the Taliban insurgents launched a coordinated to capture its control. Click here to read more (external link). This mental case is being used just like the others; like the guy who was acting as governed of Kandahar and NANGARHAR; Sharzoi or something. THEY ALL HAVE MENTAL PROBLEMS- no normal sane human being sell themselvess like those savages. What puzzles me most, is that how the hell they manage to find these kinds of abnormal chsrachters- I guess, they know how to find their own perfectly-matched weirdos.